The Director, COBFAS, Dr. Jonathan Atungwu addressing the FPY students at the event, preparatory to their departure to the various communities. 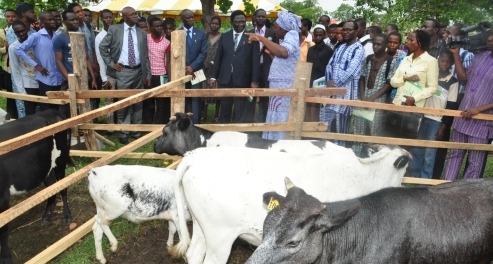 The Community-Based Farming Scheme (COBFAS) of the Federal University of Agriculture, Abeokuta (FUNAAB), has held its Orientation Programme for the 2012/2013 Farm Practical Year (FPY) students of the University. The Orientation Programme which brought about crops of experts who spoke on various advisory topics to the students, dwelled on various aspects of the FPY programme, life in the various communities where the FPY activities are going to be observed and also, the student’s academic calendar. Blazing the trail was the Director, COBFAS, Dr. Jonathan Atungwu, who spoke extensively to the students on “Overview of the FPY Programme, Course titles, Codes, Credits Units, Enterprise and election of student coordinators. Other topics discussed with the FPY students are: “Rules and regulations governing FPY Programme and expectations of COBFAS”, delivered by Dr. Eniola Fabusoro; “Rural Integration: Life in COBFAS Communities – Advantages and Challenges, Dos and Don’ts, Impact of COBFAS”, by Mr. D. D. Giwa. Other topics for the day were, “FUNAAB Ambassadors: Staying away from Social Vices” by the Dean, Student Affairs, Prof. Olufemi Onifade; “Understanding the log book” and “ the 6 months log books, farm diary and expected allowance”, by the Industrial Training Fund (ITF) representatives and the Directorate of Student Industrial Work Experience Scheme (SIWES), FUNAAB. Also, talks were given on “Health Tips” and “Security and related issues” by the Director of Health Services, FUNAAB, Dr. Olusola Talabi and the Assistant Chief Environmental Officer, Mr. Peter Bolarinwa respectively.